Flattery Will Get You Nowhere…. It has occurred to me in recent weeks that Emily is turning into a bit of a show-off. While she’s built up a nice rapport with most of the people she knows – Mummy, Daddy and her two grandmothers, for example, it seems that she’s willing to flutter her eyelashes and offer a smile to anybody who’ll pay attention. Yesterday, we were in the supermarket and she just couldn’t stop engaging with random people – from the couple who were sitting at the next table from us in the cafe, to the woman on the checkout. Everybody thought she was charming – and they were only too happy to smile and wave back. Of course it was a different story when she started fluttering her eyelashes in my direction while I was eating a chocolate Krispy Kreme donut. While I may find my daughter eternally endearing, it takes a lot more than that to get me to part with cake. 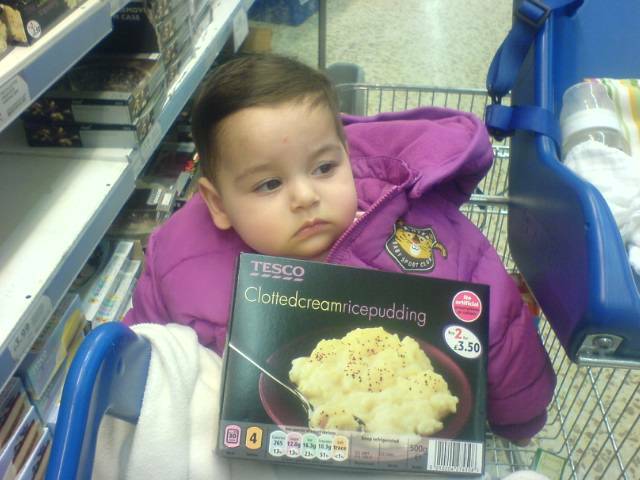 Do I have the only baby in the world who loves going to the supermarket? Over the past few months Emily has been taken to pretty much every major supermarket chain there is (since we have no loyalty when it comes to this kind of thing) – and while at first she didn’t really take much notice of her surroundings, lately she’s been fascinated by fruit and veg, fixated by fish counters and gazed intently at racks of clothing. In fact, while other people’s babies seem to fidget and scream all the way through their shopping trips, Emily tends to stay very quiet, preferring instead to suss out the baby purees and smile at whoever is pushing the trolley than start making a fuss. Her favourite store appears to be Waitrose – which can only indicate a girl with good taste – although Sainsbury’s has also proven popular, to the extent that she broke into a big fit of giggles at the checkout the other day. Perhaps her preference of store though has something to do with the comfort and convenience of their facilities for little people. Waitrose and Sainsbury’s, after all, provide nice comfy trolley seats for babies who haven’t yet learned to sit unaided (these are also a feature at Tesco and Asda) – simply strap in baby and baby has a perfect view of everything that’s going on around them. Thumbs down to our local Somerfield and Aldi, however, who appear to provide no such thing, to the extent that she has to sit in the trolley in her car seat. Which was fine when she was two weeks old and too small for the trolley seat, but isn’t exactly comfortable now. It came as no surprise to me, then, when she started screaming on our last trip to Aldi, as I wouldn’t exactly have enjoyed being pushed round in a trolley either. Once she is a bit bigger and can sit up on her own, she’ll graduate to the other type of seat, which will be even better – I loved sitting in that as a kid and almost wish they did a larger version that grown-ups can sit in while their companions push them round the store. It seems that babies have all the fun sometimes. Now that the weather has become somewhat autumnal, we have had to adjust Emily’s wardrobe accordingly – which means putting away all the cute little T-shirts and shorts and bringing out her warmer things. Today it was the turn of her new coat – a bright pink fleecy number with pink fake fur trim on the hood and sleeves, together with matching pink mittens (attached to the coat in such a way that even the Mitten Fairy would have a hard job getting her hands on them). My husband bought this when Emily was just a week old, on the basis that by the time she was big enough to wear it, the weather would be appropriate for it. I had a hard time imagining that the tiny little newborn scrap that was lying in his arms at the time would ever be big enough for it, but fast forward four months and she certainly is. As with many warm coats though, it’s a big, bulky item – complete with duffel coat style buttons that bring to mind Paddington Bear (or would do if he had worn a pink fleecy coat). Consequently, Emily was rather surprised when we wrapped her up in it to go out this morning, as protection against the rather blustery cold wind which appeared to have sprung up. What we didn’t realise was just how many inches the coat would add to her bulk. The first challenge came when we were trying to strap her into the car seat. She’s already starting to outgrow the straps on the seat, but throw the coat into the equation and suddenly the seat was filled to capacity. Eventually we managed to get her secure after much huffing and puffing and adjusting of straps, while she got ever more frustrated. The pushchair straps, meanwhile, proved no problem, but a quick trip to Waitrose on the way home spelled trouble. Since Emily is not yet big enough to sit in the fold-out seat that’s a staple of most supermarket trollies, she has to be strapped in to the special plastic ‘trolley seat’ that most supermarkets provide. Which is fine when she’s in her normal clothes, but once again, when wearing a big coat, this proved to be an impossible feat. Eventually, after I’d stretched the straps as far as I could get them and Emily had voiced her annoyance by screaming loudly enough to wake the entire car park, we gave up and simply took her coat off, strapped her in and wrapped it round her to stop her getting cold. Now why didn’t we think of that earlier? So it seems the coat is set to give us a bundle of fun over the winter months, especially as far as straps and seatbelts are concerned. On the plus side Emily, who’s had a bit of a cold the past couple of days and hasn’t slept too well as a result, slept very soundly in her car seat while she was all bundled up in it. So clearly it has its uses after all. When you have a baby, suddenly things you never really gave much thought to become matters of crucial importance. One of the most important things, however, is finding suitable places to change your baby’s nappy when you’re out and about. In this respect, shop toilets come in very handy since it’s one of the places where you can pretty much guarantee there’ll be changing facilities. What you can’t guarantee, however, is the quality of those facilities. Supermarkets vary from place to place – our local Tesco proved to be basic but bearable, at least providing a proper changing mat – while Sainsbury’s was a very pleasant experience indeed. Our nearest Asda, Somerfield and Waitrose, meanwhile (as you can tell we have no loyalty when it comes to supermarket shopping) opt for a pull-down table which you have to strap your child into. This is clearly the most useless invention ever since it consists of little more than two very thin straps of seatbelt material held together with a flimsy plastic clip. I can only assume that the designers have never had children, otherwise they would know that babies wriggle, and will find a way to worm themselves out of the strap no matter how tightly you tie it. Of the above, Somerfield ranked as the worst experience. I’m optimistic that it wasn’t reflective of all their branches, but an emergency trip to the changing room when Emily was two weeks old (the kind of emergency that necessitated a change of outfit) revealed a rather dirty place with overflowing bins and a general feeling that cleanliness was somewhat lacking. But other shops don’t do too badly. Ikea, for example, provides a very cosy changing room with a proper inflatable mat, like the kind we have at home, and even a baby gym (also like the kind we have at home). Selfridges has nice stainless steel pulldown tables, although the changing area is right next to the ladies’ toilets, and Emily was rather startled by the banging of the cubicle doors (as indeed was I). And of course Mothercare was wonderful, with lovely changing and feeding facilities – but then you wouldn’t expect anything less from them. As for Gap – well we can’t comment as the changing room was out of order, and they offered us the use of the feeding room – which essentially consisted of one chair and a vast expanse of carpet. Er, thanks….